8/20/1996 8 MB and 10/28/1996 10 MB. 97.7 FM - Alan Freed - The 10/28 broadcast was only four days before the FCC pulled the plug on Beat Radio and the tape begins with an editorial plea from Alan Freed for low power FM. 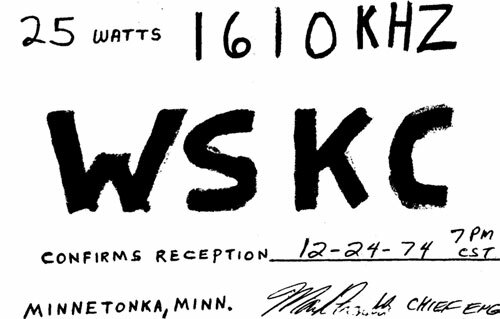 99% of WSKC's broadcasts were FM only, the AM/FM simulcast only occurred on limited number of days in a two month window from Nov. 1974 - Jan. 1975. The FM signal was received at a separate location and rebroadcast on 1610 AM. The tower broadcasting the 1610 AM signal blew down during the famous Super Bowl blizzard of Jan. 1975. The above QSL verification card was received from the person re-broadcasting the signal on 1610 AM, which lists the power as 25 watts. 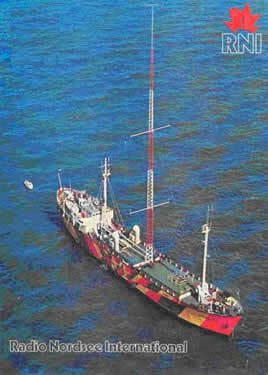 Read more about Radio Northsea International here. See video coverage of the fire bombing here.